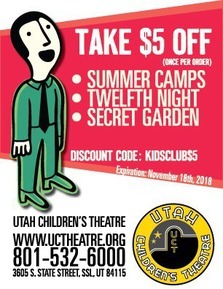 2018 Shakespeare Festival for Kids & Adults with Short Attention Spans $5.00 off with our coupon code "KIDSCLUB$5"
Every Saturday AUGUST 18th - SEPTEMBER 29th 2018 Do you want your children to grow up well rounded and read? Do you despise the thought of Shakespeare? Do you love Shakespeare? Do you want to look sophisticated to peers? Do you want to see great performances of Shakespeare but don’t want to sit for three hours? If you answered YES to any or all of these questions, then our festival is the event for you!